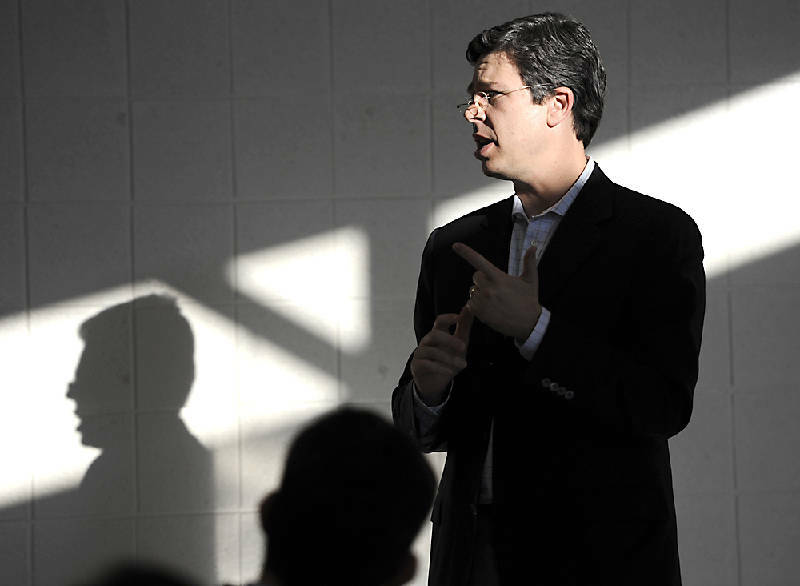 Senator Andy Berke (D-Chattanooga) speaks at a town hall meeting in Chattanooga, Tenn., in this file photo. NASHVILLE -- The political equivalent of a school-yard brawl has broken out between one of the nation's largest for-profit providers of online learning programs, K12 Inc., and a state legislator from Chattanooga who is proving to be one of the company's toughest Tennessee critics. In an Aug. 28 column published in the Chattanooga Times Free Press, Sen. Andy Berke, D-Chattanooga, labeled the Virtual Public Schools Act as "possibly [the] most destructive" bill to pass the Republican-controlled General Assembly this year. The new law's passage, Berke charged, was aided by K12's lobbyists and "funnels thousands of Tennessee public education dollars to a convicted felon, high-profile Washington figures and millionaire executives who live around the world." Calling K12 "partly the brainchild of Michael Milken, a convicted felon who served time in prison for his role in the 1980s as the 'junk-bond king,'" Berke said Tennessee taxpayers "are now on the hook for K12 executives' salaries." "What K12 hasn't proved is that it can help your child learn," Berke contended. The General Assembly passed the bill over most Democrats' objections this spring. K12 Inc. later contracted with Union County Public Schools and opened the state's first "virtual school," enrolling at least 1,100 students from school districts statewide. Union County is receiving $5,300 per student, keeping 4 percent for itself as an administrative fee and providing the rest under contract to K12. The company is firing back at Berke in a statement posted on the company's website. K12's vice president of public affairs, Jeff Kwitowski, calls Berke's assertions "quite an inflated indictment, but that's about the extent of his argument, at least as it relates to actual policy." "After that," Kwitowski writes, the Chattanooga lawmaker "packs his piece with factual errors, ad hominem [personal] attacks, and wild accusations. It's an old debate trick used when one is unwilling or unable to argue the merits for or against an issue." He said Berke is arguing online public schools are "bad because K12 is bad. And K12 is bad because one of their investors is bad. Because of this one individual, the entire company -- its teachers, student counselors and advisors, curriculum developers, receptionists -- are all guilty by association." "Of course," Kwitowski writes, "it's nonsense," saying Milken "was never an employee with K12, never served on K12's board, or held any management or leadership position." He disputes Berke's assertion that a U.S. Department of Education study "concluded there was no evidence that K12's method of cyber-schooling provided any benefit over traditional schooling." One study, Kwitowski cites, is the education department's "meta-analysis" of previous studies of online learning and traditional face-to-face teaching. Kwitowski quotes part of it that says "students who took all or part of their class online performed better, on average, than those taking the same course through traditional face-to-face instruction." Berke said in a subsequent email that Kwitowski's post is "flawed from the headline on down." The "great majority of estimated effect sizes in the meta-analysis are for undergraduate and older students, not elementary or secondary learners," Berke said. "Although this meta-analysis did not find a significant effect by learner type, when learners' age groups are considered separately, the mean effect size is significantly positive for undergraduate and other older learners but not for K-12 students." A review of the U.S. Education Department's study itself says that it used both K-12 studies and those involving older or higher education students because there are so few studies regarding online learning's impact on K-12. Federal researchers concluded in the study that "when used by itself, online learning appears to be as effective as conventional classroom instruction, but not more so." Kwitowski took issue with Berke's attack on the for-profit nature of the venture with Union County. In an interview, Kwitowski noted schools use any number of for-profit contractors ranging from textbook publishers to school bus operators. He also cited what he said was Hamilton County schools' use of private vendors to create online courses for the e4TN pilot project it operated for the state. The project was funded by a federal grant, and the county made available a number of individual courses across the state. In his critique, Berke said, "we are entering uncharted waters in Tennessee public education. We have no precedent for transferring public education dollars to a private company with no restrictions, no expectations and no consequences." Berke said in response to Kwitowski's charges that "I enthusiastically support education initiatives and innovations designed to help our students learn and improve outcomes -- including online schooling" like the e4TN program, which he called "a state-managed online learning program that has been all but shut down. "Instead," Berke charged, "we're giving our public education dollars to a private corporation -- a corporation that, like any publicly traded corporation, looks to keep its shareholders happy by maximizing profits and minimizing costs. The problem comes when K12 keeps its shareholders happy with our taxpayers' funds, at the cost of our children's education." Contact Andy Sher at asher@timesfreepress.com or 615-255-0550.